Iran is developing new missile technologies to improve its ability to wage asymmetrical warfare. Saudi Arabia’s April 29 parading of its Chinese-made DF-3 medium-range ballistic missiles (MRBMs) received significant attention. Similarly, Iran’s May 11 defense exhibition attracted substantial interest, which went beyond the hubbub surrounding Iran’s unveiling of a mockup of the U.S. RQ-170 unmanned aerial vehicle (UAV), which crash-landed in Iran in 2011. What was overlooked, however, was the unveiling of a number of weapons that have the potential to increase the challenge posed by Iran’s anti-access/area-denial (A2/AD) capabilities. The exhibition of the Islamic Revolutionary Guard Corps Aerospace Force’s (IRGC-AF) achievements was a high-profile event. In attendance were Supreme Leader Ayatollah Ali Khamenei and a large entourage consisting mainly of senior regular military and IRGC officers. The event was notable for the detailed media imagery released, and its timing, almost two weeks after Saudi Arabia made headlines by parading its Chinese-made DF-3 missiles for the first time. This was an apparent attempt to send a strategic signal to both Iran and the U.S. At the exhibition, the IRGC-AF revealed a number of new radar and surface-to-air missile systems, highlighting Iran’s advancement in modernizing its air defenses against U.S. and Gulf Cooperation Council (GCC) airpower. More pertinent to Iran’s A2/AD effort, however, was the unveiling of a number of new missile systems. Following its attempt to build an anti-ship ballistic missile (ASBM), by equipping its solid-fuel Fateh-110 short-range ballistic missile with an electro-optical seeker, Iran developed two new variants of the Fateh-110. The Hormuz-1 was described as having an anti-radar role, suggesting the use of a passive anti-radiation seeker conceptually similar to the U.S. HARM missile and the Russian supersonic KH-31P. These missiles could be used against the radar of the Patriot and THAAD ballistic missile defense systems, as well as other radar in use by the U.S. and a number of GCC states. With a similar exterior, the Hormuz-2 is also based on the Fateh-110 airframe, and was described as having an anti-shipping role. It appears that Iran wants to complement the electro-optically guided Khaleej Fars with the anti-radiation guided Hormuz-2, conceivably allowing for saturation attacks against U.S. naval vessels, including the high powered radar found on U.S. cruisers and destroyers. While U.S. point-defenses will likely be effective in dealing with Iranian missiles in most engagements, the use of an anti-radiation seeker will force U.S. ships to intercept these missiles, thereby reducing the number of available missiles left to intercept other missiles Iran may fire at military bases in the Arab Gulf states. As with the Fateh-110 in its latest variations, the Hormuz-1 and Hormuz-2 have a range of 300 kilometers. A video of the Hormuz-1 being tested was released by state media, shown here on YouTube. Another newly unveiled weapon in Iran’s A2/AD arsenal is the “Ya Ali” land-attack cruise missile. This missile was displayed in testing colors, unique among the displayed items, suggesting it is not yet in service. Scant information was made available other than that the missile has a range of 700 kilometers. Should this cruise missile enter service in significant numbers, and be equipped with a sufficiently advanced guidance system (no small feat for a first attempt at a land-attack cruise missile), it will complicate the defense modernization efforts of the GCC. Compared to ballistic missile defense, cruise missile defense is still in its infancy. The United Arab Emirates is the only Arab Gulf state that has invested in the kind of short-range air defense useful against cruise missiles, through its acquisition of the Russian Pantsir system. While the Ya Ali is Iran’s first publicly displayed land-attack cruise missile, it is not the first missile of this type Iran has announced. In September 2012, a high ranking Iranian defense official stated that Iran would unveil the Meshkat cruise missile with a range of 2,000 kilometers. It was never unveiled, but Iran is known to have illegally obtained from Ukraine a number of medium-range air launched cruise missiles from the Soviet era. 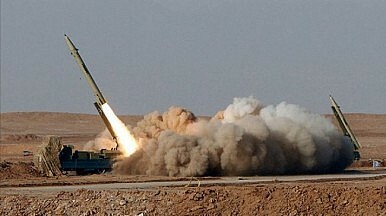 Moreover, the National Air and Space Intelligence Center’s 2013 Ballistic and Cruise Missile Threat report listed the Meskhat as a land-attack cruise missile with a conventional warhead and range of 2,000 kilometers, capable of launching from aircraft, naval vessels, and ground-based launchers. It is unclear if the shorter-ranged Ya Ali cruise missile will also be launched from aircraft and naval vessels. Other items unveiled pertinent to Iran’s A2/AD capabilities include the cluster-warhead equipped version of the Zelzal-3 ballistic missile and the Raad-301 precision guided bomb. The cluster warhead equipped Zezal-3 is Iran’s first publicly displayed cluster warhead ballistic missile. Image sequences released by state media show cluster munitions being fired at a base layout common to U.S. bases in the Middle East. The Raad-301 follows a long line of Iranian air-launched precision guided munitions. Most of these have been laser-guided and electro-optically guided bombs and missiles, but the Raad-301 appears to utilize a GPS guidance package. Given that the exhibition was done by the IRGC and not the Air Force, it is reasonable to assume that the Raad-301 is meant for the IRGC’s UAV force, including the Predator-class Shahed-129 UAV and the jet-powered Karrar combat UAV. Should the Raad-301 work as advertised, Iran would have a guided weapon that would enable jet-powered combat UAVs like the Karrar to make a significant contribution on the battlefield. The recent high-profile unveiling of different Iranian weapons systems demonstrates the country’s attempt to improve the capability of its A2/AD systems. The U.S. and the Gulf States will need to pay attention to the asymmetric weapons and tactics being developed by Tehran. China or Iran: Who Is the Bigger Threat to U.S. Airpower? A new comparative analysis sheds light on the threat Tehran’s ballistic missile force poses to U.S. airbases. Be Honest About the B-21: When Strategic Bombing Works and When It Doesn'tA2/AD Is Dead, Long Live A2/ADGetting the Right World War I Metaphor for a US-China ClashPerry in Japan, War in the Pacific, and the Rise of ChinaCuarteron Reef’s New Radar: The China Coast Guard’s Best New Toy?